Kegco's HBK309X-2 is an attractive dual faucet kegerator that allows you to dispense up to two of your favorite home brewed beers at the same time! It boasts all of the same great features as other high-quality Kegco draft beer dispensers, as well as a complete two-tap homebrew beer direct draw system that allows you to dispense two kegs at once. This dispense system comes with exciting upgrades like a two faucet stainless steel draft beer tower, commercial grade two product dual gauge regulator, and glossy red 5 lb. aluminum CO2 tank at no additional charge - a $37 value! The Kegco HBK309X-2 has been designed with a matte black cabinet and a sleek black stainless steel door for a modern look that complements any decor. Black stainless steel is a unique black-graphite tone that resists more smudges, fingerprints, water spots, and streaks than standard stainless steel. Most stainless steel surfaces do not have a fingerprint-resistant finish and will need special polish to keep them looking new. Black stainless steel can be easily cleaned without requiring any special polish - simply clean with a damp cloth followed by a soft towel. The HBK309 series features a blue LED digital display that shows an accurate reading of your kegerator's internal temperature, as well as push button controls that make it easy to adjust. 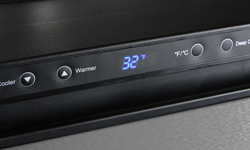 You no longer have to guess what temperature a number on a dial will produce - simply press the up or down button, and the temperature is adjusted by one degree. The display can be set to either Fahrenheit or Celsius. The HBK309 temperature can range as low as 32°F or as high as 75°F. 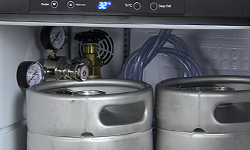 Fan-forced cooling gives these HBK309 home-brew kegerators one of the coldest temperature ranges of any keg beer dispenser on the market today, allowing them to be set as low as 32 degrees. 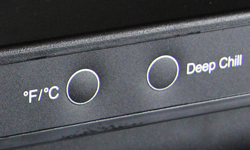 The fan helps provide even, consistent cooling throughout the cabinet. The wide temperature range also makes it possible for you to ferment your home-brew inside the kegerator, giving you a precisely controlled fermentation environment. The spacious interior of these HBK309 kegerators easily accommodates up to three 5 gallon Cornelius ball lock home brew kegs, allowing you to dispense one keg of home-brew beer while storing two more at their ideal temperature. 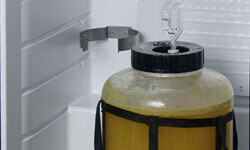 The HBK309 can also hold a 6 gallon bucket or carboy if you'll be using it as a fermentation chamber. Thanks to the HBK309 series Deep Chill function, you no longer have to wait overnight for a warm beer keg to reach the correct serving temperature. A simple push of the Deep Chill button, and your compressor will work continuously for up to 24 hours to cool down your keg. Once the keg has reached the desired temperature, simply press the Deep Chill button again to return the unit back to its normal operation. 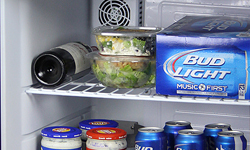 This HBK309 series kegerator can easily be converted into a refrigerator whenever you need. It includes two adjustable shelves that provide extra storage for food and beverages, and can be spaced far enough apart to hold 2-liter bottles or gallon jugs. The wide temperature range makes it a great option for storing bottles of wine as well. 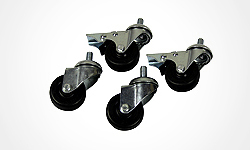 From the kitchen to the game room to the patio, easy-rolling casters allow you to enjoy your home-brewed beer in any room of your home! They can be locked into position so that the kegerator won't move again until you want it to. Kegco's Double Faucet Home-Brew Kegerators include all of the equipment you'll need to dispense tasty home brewed beer from up to two kegs at a time. The two-tap dispense system comes with a two-faucet polished stainless steel draft beer tower with chrome faucets, an empty 5 lb. aluminum CO2 tank with a glossy red finish and two-product dual gauge regulator, and two sets of ball lock home-brew keg couplers.